You can buy this ETF through your brokerage for your retirement account or regular investment account. For 401k, please check with your administrator. Invest in popular ETF can be done with as little as 1 share (i.e. $200.71 / share). Morningstar has ranked this U.S. stock ETF with 4 stars rating. In 2014, the year-to-date return is 9.68%. The 1 year annualized return is 25.06%. This popular ETF has returned 20.47% over the past 3 years, and 16.74% over the past 5 years. 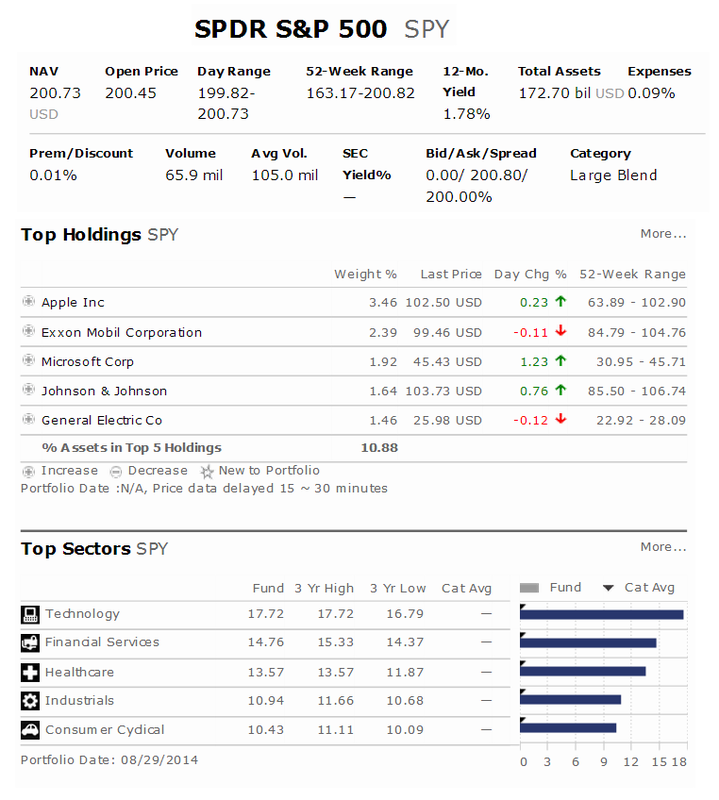 As of September 2014, top 5 stocks are Apple Inc (AAPL), Exxon Mobil Corporation (XOM), Microsoft Corp (MSFT), Johnson & Johnson (JNJ), and General Electric Co (GE). Top 5 sectors are technology, financial services, healthcare, industrials, and energy. This SPDR S&P 500 ETF has very low expense fee of 0.09%. This stock fund has a decent yield for income. Don’t expect super return or lousy return.